Call of Duty is one of the biggest gaming franchises in the world, and Activision licenses the brand out to other companies to make merchandise. A lot of the stuff you’ll see the Call of Duty name plastered across seems to be designed for children, which is raising some questions: Why is Activision selling stuff based on its Mature-rated military series to kids? There’s one exception, however: Mega Bloks, which are big blocky Lego-like toys, recently re-branded as Mega Construx, that happen to have an official sponsorship from Call of Duty. How does Activision explain that? Simple: they’re for adults! In an email to GamesIndustry.biz, an Activision spokesperson said that the official Call of Duty Mega Bloks are meant for adult fans of the series. Used to transport military equipment, this buildable shipping container pulls double duty when you open it to reveal a polar outpost and armory loaded with climbing and combat gear! Build the weapons rack and outfit your two arctic soldiers for a recon mission on northern peaks! The collectible container features a deluxe graffiti detail inspired by the Call of Duty® games. Use the pronged roof to connect multiple armories and build a sprawling battle complex! Hmmm. Sounds like how I used to play with my Mega Bloks when I was a kid! The toys also come with a “10+” age recommendation, but Activision stresses that’s a safety warning and not an indication of their target audience. In my experience as an adult who buys toys, “collector” language usually just means something’s more expensive. In some cases that’s because it is being marketed to an adult who can afford to pay more. Like, say, a $400 statue of one of their favorite video game characters. In Mega Bloks’ case the collectors sets range from $5 to $20, the same as other Mega Bloks sets. Activision Blizzard did not immediately respond to a request for further comment by Kotaku. Now just because something’s a toy doesn’t mean an adult shouldn’t buy it. And just because a toy is based on something adult, like a military shooter series about mowing down hundreds of people, doesn’t, at least in my opinion, mean children shouldn’t buy it. 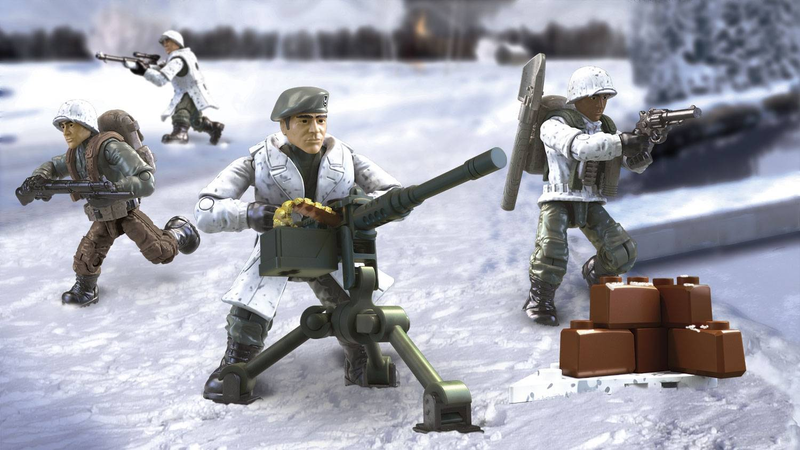 The Mega Bloks Call of Duty sets, after all, basically look like a modular evolution on the classic camouflage-colored plastic army men toys from days past. But I do enjoy watching a multi-billion dollar company get tongue-tied trying to pretend none of that is actually the case.